Receiving any type of court document can be frightening and stressful. While papers like summons and complaints indicate that you are somehow directly involved in a court case, a subpoena is slightly different. 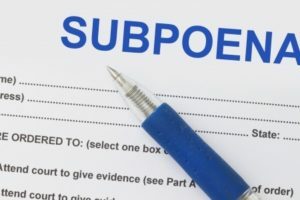 People around the country often receive subpoenas, even if they are not the plaintiff or defendant in a case, based on the need for their testimony in court. A subpoena is a document issued by a court that requires you to appear in court to either testify or present documentation relevant to the case. The word “subpoena” translates to “under penalty,” which is why ignoring a subpoena can result in serious consequences like fines and jail time. Attorneys often utilize subpoenas to gain important information that will help support their client’s case. Attorneys strategically use subpoenas to gather vital information from whoever possesses or is in control or releasing that information. Requests for blood test results, DNA samples, medical bills, insurance records, income tax returns, photographs, employee records, and computer files are all commonly made through subpoenas. When an individual is served a subpoena to appear in court to testify, it is likely that he or she has relevant knowledge about the situation surrounding the court case, the defendant, or the plaintiff. How Should You Respond to a Subpoena? If a process server knocks on your door and hands you a subpoena, it is important that you respond within the allotted amount of time. Ignoring your subpoena will not make your responsibility disappear, and instead will just land you in more trouble. Simply read through your subpoena to determine what is being asked of you. If you are unsure of the implications of your subpoena, reach out to an attorney for support.